Miklos grinned as the overladen bandit leader struck the water with a splash. He clapped. “Bravo!” he cried wincing at the pain in his shoulder. Ludo sighed, the days activities had been exciting, a pity that Captain Scylla had not wanted to capture the river pirates. He felt that the Captain had missed an opportunity. Feldard glanced up with a hopeful expression hearing Ludo talk about stopping for the night. Even his strong constitution was being taxed by the motion of the riverboat. “I take the middle watch, ” he offered. “Aye Feldard, honouring oaths and one’s comrades is important. Do we know where Nikolas’ mother lives? My concern is that Threshold is a frontier town. The Duke’s law is represented here, but only barely. Golthar will have plenty of men looking for a chance to earn some money. We also have to consider that with his power he may have the Dukes representatives in his pay, in short we must be on our guard, or we could find ourselves in the local jail with Golthar holding the map”. The Mudlark pulled into port at the thriving frontier town of Threshold. Along the town’s wharves, river boats bob up and down at their moorings. The Windrush River flowed around an island packed with buildings. A guard patrol was posted to inspect all vessels as they arrive at the town. 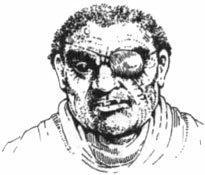 They were led by a grizzled veteran with an eye patch and a deep scar on his left cheek. With his huge hands, the sergeant unrolled a parchment and, giving a mighty cough reminiscent of distant thunder, cleared his throat. Stephan’s jaw was askew at Patch’s proclamation. But instead of objecting, he grabbed a large sack from the Mudlark and stowed his bow and quiver in it. Using the loop from the sack’s drawstring, he hoisted the load over his shoulder. Ludo upon hearing the grizzled veterans statement, sighed “sir, I am just a hunter, my weapons are of no danger to anyone in town, and I would be more than happy to unstring my bow whilst I am in town”. By the way I am looking for Cardia the Elf – do you know where I could find her”? When out of ear shot of the guard, Ludo turns to his comrades, whilst in town keep you valuables safe and out of sight, your swords and daggers loose in their scabbards – you will never find a more wretched hive of scum and villainy. We must be cautious. If the guard backs down Maruc will bless him and ask the way to the nearest Tavern. Miklos slunk back a way. He hunted in his back pack and found his old student clothes he used to run around Specularum with when he was truenting with the others. He slipped over the tunic and belted it up. He felt less mage-like and more the noblemans son. He didn’t want to stick out too much in this cleric run town. As they entered through the gates of Threshold, Ludo remarked to the group “The day is still young, lets go and return Nicolai to his home, that after all is the main reason why we are here”.